At this year’s annual Berkshire Hathaway meeting in Omaha, ­Warren Buffett, the high priest of value investing, uttered words that would have been grounds for excommunication if they had come from anyone but him. There is a deep and important debate going on in the investment community, one with profound repercussions for both professional money managers and their clients. Some believe that Buffett is right—that we have become an asset-light economy and that value investors need to adapt to accommodate such changes. Noted value managers like Tom Gayner of Markel Corp. and Bill Nygren of Oakmark Funds, for instance, count companies like Amazon and Alphabet among their top holdings. The fact that these stocks often trade at above-­market valuations—a factor that once scared away orthodox value investors—hasn’t deterred them, because the companies’ futures are so bright that they’re worth it. The father of value investing was Ben ­Graham, who gave birth to it roughly 100 years ago, when 100% of the components of the Dow Jones industrial average were just that—industrials. Hard assets were what drove companies like Anaconda Copper and National Lead. Consumer marketing was in its infancy; in 1915, the closest thing the Dow had to a consumer products company was General Motors (or maybe American Beet Sugar). Even in an economy transformed by technology, many of Warren Buffett’s principles of value investing apply. Here, some dos and dont’s. ■ Always look for a business with a clear-cut competitive advantage. If you can’t explain to your spouse what makes a company special as a long-term moneymaker, it probably isn’t. Amazon has a stranglehold on e-commerce; Google owns search; Sherwin-Williams, in which my fund owns a stake, dominates brick-and-mortar paint stores. What makes a company able to earn outsize profits over the next generation? ■ Try to find companies with a small market share, a huge addressable market, and a large competitive advantage. This was Warren Buffett’s recipe for success with Geico, a once-tiny auto insurer that sold directly to consumers rather than pay agents’ commissions. These traits may be present in GrubHub (pictured above), the first mover in the food-delivery market, which my fund also owns. It has an industry-leading market share yet still has less than a 1% share of all American restaurant meals consumed each year. Still TBD: whether consumers will continue to migrate away from in-restaurant dining, and whether Uber and Amazon will try to eat GrubHub’s lunch. ■ As Buffett has said, never confuse a growing industry with a profitable one. One cautionary tale from the 2000s: Vonage, a pioneer in routing phone calls over the Internet. Business exploded over the past decade, but so did competition. Profits for everyone imploded, and the big winner (as is so often the case) has been the consumer. Vonage’s stock has never gotten back to its $17/share IPO price. ■ Avoid businesses whose best days are behind them. This is true even if you’re paying a cheap price relative to current earnings or book value because, in the long run, underlying business quality trumps price. Exhibit A: Sears Holdings looked cheap all the way down until it declared bankruptcy earlier this fall. You can still buy a fractional interest in Sears’s future today for a very cheap price, by the way—36¢ a share, as of this writing. Unlike branded companies, digital businesses often benefit from network effects: the tendency of consumers to standardize on a single platform, which reinforces both consumer preference and the platform’s value. Because of this, the market shares of these platform companies dwarf those of the consumer products giants; software businesses like these are often characterized by a “winner take all” or “winner take most” dynamic. Combine this with the fact that they require little to no capital to grow, and you have Value 3.0—business ­models that are both radically new and enormously valuable. Meanwhile, Bezos has built a mountain or two of his own. As the first big mover in ­e-commerce, he created a network of warehouses and logistics capabilities that now allows him to deliver packages to more than 100 million Prime customers in two days or less. 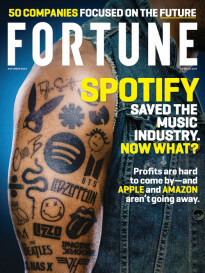 He too has chosen to reinvest Amazon’s profits back into the business in various forms: lower prices for customers, ancillary services like Prime Video, and entirely new industries like Amazon Web Services, which provides outsourced, essential computational “plumbing” for the next generation of digital startups. In its core retail business, Amazon still has only a roughly 5% share of U.S. retail commerce despite being at it for more than 20 years. Amazon’s stock may be overvalued today—but with its dual moats of immense customer loyalty and low-cost provider status, there is no argument that it is very valuable. Some industries are particularly well positioned to benefit both from the drivers of “Value 3.0” (network effects, growth that isn’t capital intensive) and more traditional advantages (wide competitive moats). Here are some industries to watch right now and a couple to be wary of. Platform tech It’s difficult to see how Alphabet’s Google subsidiary will lose its 95% market share in mobile search. Advertising on the Internet represents only 30% of total worldwide marketing spending, so Google has room to grow. Likewise, Amazon has only a 5% share of U.S. retail spending; thanks to its network of warehouses and its frictionless customer interface, it possesses powerful competitive advantages. Aerospace While it’s tempting to be swept away by the might of digital platforms, it’s also true that most business continues to be done in the real world, not the ether. Consider the aerospace industry: It has grown 5% per annum over the past 50 years, well ahead of global GDP, yet 80% of the world’s population still has not yet set foot on an airplane. Add to this the fact that aerospace companies tend to be duopolies or oligopolies, and you have a recipe for powerful economic compounders. Not surprisingly, industrial conglomerates Honeywell and United Technologies (maker of the space suit pictured above) are both taking steps to become more aerospace-focused. Autos A cyclical, capital-intensive business that makes commoditized products is a troubled industry to begin with. If driverless cars become a reality, then car sharing is not far behind. Once that occurs, it’s virtually certain we’ll need fewer automobiles. Falling production on a fixed-cost base—look out below. Insurance Another cyclical, commoditized business with no barriers to entry except capital—which is to say, no barriers at all. Returns on equity in insurance have been in structural decline for 30 years, with personal lines most at risk. Warren Buffett, whose Berkshire Hathaway conglomerate is invested in insurance, has acknowledged that self-driving cars could significantly decrease auto-insurance premiums. Such coverage may join the buggy whip in terms of utility within the next generation.